It can sometimes be difficult to find exactly what you’re looking for in an extensive knowledge database such as ForwardOsmosisTech. For this reason, we have decided to summarize all our forward osmosis membrane related knowledge on a single page to give you – our readers – a more accessible entry point to the ForwardOsmosisTech portal. We hope you enjoy our efforts below. And don’t forget: if you have questions, comments, and suggestions for improvements please feel free to drop us an email at forwardosmosistechportal@gmail.com. Forward osmosis is the process of spontaneous water diffusion across a semi-permeable forward osmosis membrane in response to a difference in solute concentrations (i.e. osmotic pressures) on either side of the semi-permeable membrane. In essence, the diffusion of water can be explained by the second law of thermodynamics, which implies that systems always spontaneously evolve towards a state of thermodynamic equilibrium where the system’s entropy (or amount of disorder) is maximized. And from an entropy point of view, maximum disorder – in a system consisting of two aqueous solutions with different solute concentrations separated by a semi-permeable membrane – is achieved when enough water has diffused from the low concentration side to the high concentration side to eliminate the difference in solute concentration. Forward osmosis is a natural process, which takes place all around us on an everyday basis. 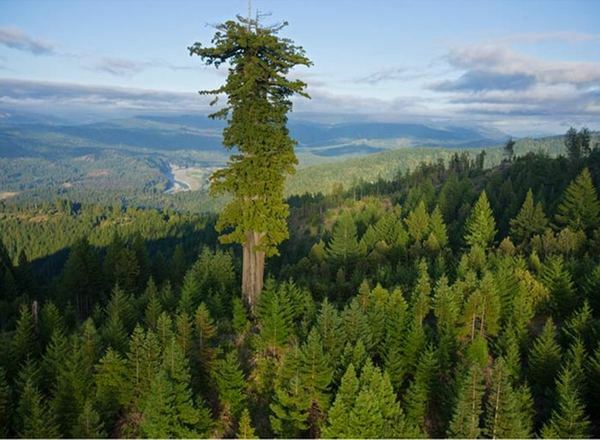 Forward osmosis enables plants to transport water from their root systems to their leaves and it provides the primary means of transporting water in and out of cells across most organisms in Nature. For more detailed information on forward osmosis processes, please refer to our article: “The principles of forward osmosis (FO)“. How does a forward osmosis membrane work? Generally speaking, membranes for water treatment applications are thin, porous, and permeable materials, which can be used as selective barriers between aqueous solutions. In most applications, water treatment membranes are used to remove unwanted substances (e.g. suspended solids, bacteria, solutes, etc.) from aqueous solutions. In simpler terms, contaminated water enters on one side of the membrane and – depending on the membrane’s selectivity properties – less contaminated water exits on the other side of the membrane. 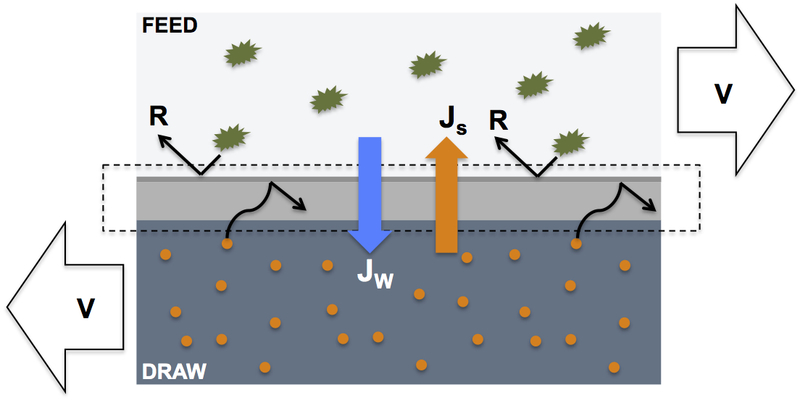 Selectivity properties are commonly achieved by adjusting the pore size of the membrane material to prevent contaminants of interest to pass through the membrane. It is important to note, that osmotic pressure is a colligative property of solutions, meaning that it depends exclusively on the number ratio of solute particles to solvent molecules in a solution, and NOT on the type of chemical species present. Hence a 1M NaCl solution with a Van’t Hoff factor of 2 will exert the same osmotic pressure as a 2M sugar solution with a Van’t Hoff factor of 1. In our article “Forward osmosis (FO) membranes and membrane processes” you can find more detailed information about the forward osmosis membrane performance parameters illustrated in the figure below. You might also be interested in our article “Forward osmosis (FO) membrane designs and materials” where we summarize the main membrane designs and materials in the field of forward osmosis. How do forward osmosis membranes differ from reverse osmosis membranes? As mentioned earlier, forward osmosis process are driven by osmotic pressure differences and the direction of water diffusion is from low concentration (the feed side) to high concentration (the draw side). In most cases, there is no hydraulic pressure difference at work in forward osmosis processes (ΔP = 0). Reverse osmosis processes, on the other hand, are driven by hydraulic pressure differences and the direction of water diffusion is from high concentration to low concentration (i.e. against the osmotic pressure). In other words, in reverse osmosis applications, the hydraulic pressure applied must be larger than the osmotic pressure of the solution to be treated in order for water to diffuse through the reverse osmosis membrane. So the main difference between forward osmosis membranes and reverse osmosis membranes is that reverse osmosis membrane require energy-intensive hydraulic pressures to operate whereas forward osmosis membranes require only osmotic pressures. Well – you may ask – if forward osmosis membranes do not require energy-intensive hydraulic pressures, why aren’t all water membrane processes based on forward osmosis processes? The short answer to this question is that forward osmosis systems do not directly produce decontaminated water as is the case for reverse osmosis systems. In forward osmosis processes, the decontaminated water ends up in the high concentration draw solution and – if needed as an end product – must be subsequently separated from the draw solutes. Want an overview of applications where forward osmosis systems are ideally suitable? Check out our forward osmosis applications page! In our article “Forward osmosis (FO) membranes and membrane processes” you will find an in-depth description of the differences in membrane structure between reverse osmosis and forward osmosis membranes. What determines forward osmosis membrane performance? 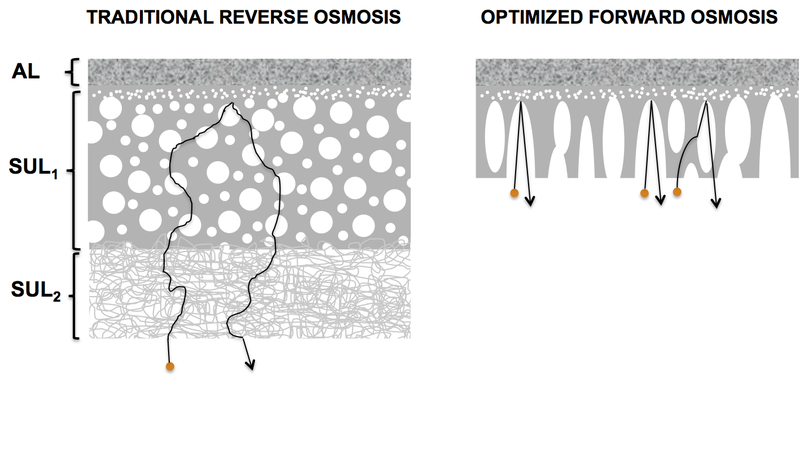 Before going into details about forward osmosis membrane performance, it is useful to note that most forward osmosis membranes are of the asymmetric composite type – meaning that they consist of a nanometer thin rejection layer (typically 100-200nm in thickness) fused with a micrometer sized underlying support layer (typically 100-200μm in thickness), which provides mechanical support and overall strength to the membrane material. The membrane A-value value (also known as the pure water permeability coefficient) is a property of the membrane’s active layer and it determines the water flux performance at a given osmotic pressure difference across the active layer of the membrane. FO membrane developers seek to increase the membrane A-value to improve the water flux across the membrane during FO operation. The membrane B-value (also known as the salt permeability coefficient) is a property of the membrane’s active layer and it determines the reverse diffusion of a given draw solute at a given concentration difference of the solute across the active layer of the membrane. FO membrane developers seek to reduce the membrane B-value to limit the amount of draw solute being lost into the feed stream during FO operation. The membrane S-value (also known as the structural parameter) is a measure of the resistance of the membrane’s support layer towards solute diffusion . FO membrane developers seek to reduce the membrane S-value because the smaller the S value, the easier it is for solutes to diffuse inside the porous support layer, and the higher the water flux performance. If you’re interested in a more in-depth explanation of how A, B, and S values dictate forward osmosis membrane performance check out our article: “How forward osmosis (FO) performance is limited by concentration polarization“. Which geometrical form-factors are available for forward osmosis membranes?